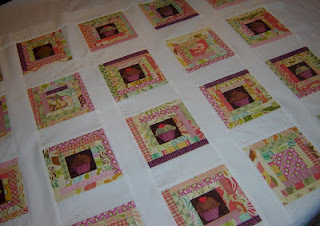 I think this quilt done in Charlie Brown colors is a genius idea! Judi, I have forwarded your contact information and you should receive your quilt pattern shortly. 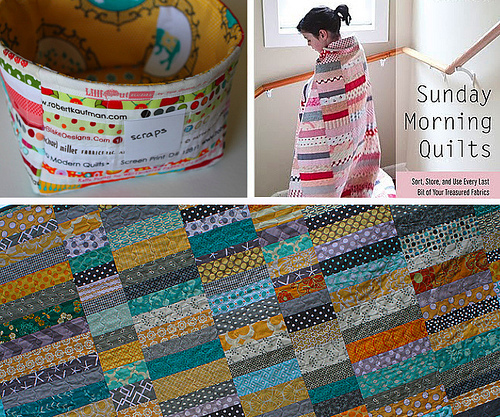 A few weeks ago I participated in Lindsay's Craft Book Month series, making a selvage bucket from Sunday Morning Quilts. 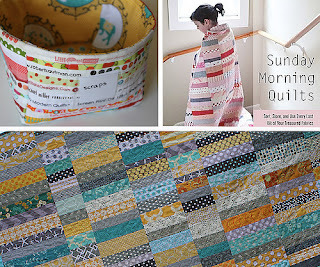 Lindsay is featured on the Stash Books blog today, along with a recap of the projects made from Stash Books. I have many Stash books in my craft library. What about you? Do you have a lot of books? Do you just read them, or do you make projects from them? I hope you have a wonderful weekend. It's supposed to cool down here in the Central Valley of California. That can't happen soon enough for me! The Name Game: Creating At Home, a pattern review and a giveaway! Several months ago (much longer than I would like to admit), Cindy from Creating At Home asked me to do a pattern test of her Chevron Accent Throw quilt pattern. I was really excited, because for a long time I had been wanting to do a chevron quilt based on a favorite sweater. She sent me the pattern and I took it along when I spent a weekend in June quilting at a friend's cabin. I finished the top, and although I planned on reviewing the pattern in summer, somehow it ended up folded and living in a stack of other quilt tops. A couple of weeks ago,I realized I had been completely remiss in reviewing the pattern. So the first part of today's triple play will be a pattern review of the Chevron Accent Throw. First of all, Cindy states that the skill level for making this quilt is beginner. I would agree. It is very well written, including great instructions and photographs to walk you through sewing and trimming half-square triangles. As written in the pattern, there are three block configurations, which are then sewn together in four rows of four blocks each. The cool thing is that you make a total of eight Block 1 (and four each of the other two block configurations), and then in four spots, you just turn Block 1 around end for end to continue the chevron pattern--easy peasy. It is written as a two-color quilt. Of course, I added to the degree of difficulty by making it with seven different colors, which meant I had to follow the diagram, but instead of sewing it together block by block, I sewed it together row by row. That took a little bit longer, and is a complete deviation away from the pattern as it is written, but it adds to the pattern's versatility. The other thing I really like is that is an uneven chevron. I'm so happy with this quilt. I love how it was just the right size and number of rows to mimic my sweater. After using no. 8 perle cotton on my Amish quilt, I wanted to do something similar with this one. I still have some bugs to work out with quilting with the thick thread, and then I noticed some Sulky brand100 percent cotton, size no. 12, in my LQS. It might be the answer--a little thinner than the no. 8, but still thick enough to make a big impact. So, now more about Cindy and her blog. When I started my blog in 2006 (http://www.creatingathome.com/2006/09/new-ribbon.html) I was a Stampin' Up! Demonstrator and wanted to have a blog to share my cards and scrapbooking pages with other stampers. I also needed a name for my growing downline group. At that time I chose "imagine. dream. create." 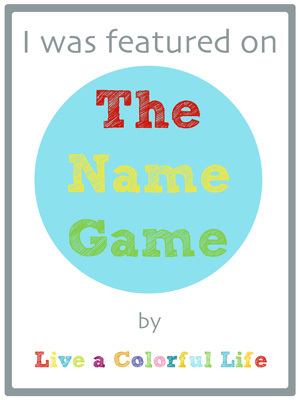 as my blog name and I loved it/lived with it for several years. Once I gave up stamping and turned my pursuits more towards quilting, sewing and diy I decided my blog needed a fresh new look and a new name, too. I wanted the name to encompass all of my hobbies and not be too specific. At first I thought of "Creating a Home", but it was already taken and then I thought "Creating at Home" was the perfect name for my blog! Now I go back and forth on it and think I could've come up with something better, but I'll stick with this. It was a bit of a pain to switch everything over to the new name and domain and I am sure I lost some blog readers during the switch! Sure, it may be embarrassing, but that's ok! lol Some others I considered were Ruffles and Rosettes, Keefers Cabin no. 73 (which is the name I decided to give my new Etsy shop and pattern designs), Sew Much, Creative Pursuits, and I even considered naming it Cindy Keery, after myself. 'Glad I didn't go with that last one cuz that would just be weird. I'm happy with the name overall. Just recently I was introduced in person as "Cindy from Creating at Home" to a group of enthusiastic women. It was a little surreal that I'd be known by my blog name, but it made me so happy. You might have noticed that not only are there pictures of quilts, but also some yummy food. I hope you will head over to Creating at Home, because there are hints on painting furniture, slip covering, recipes, really such a broad spectrum of wonderful things to help you create a warm and inviting home. 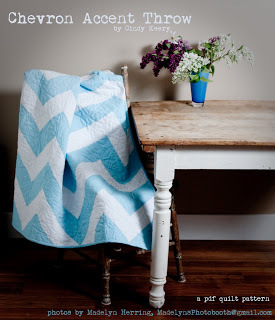 Cindy has also generously offered to give away one Chevron Accent Throw pattern. So, let's see. 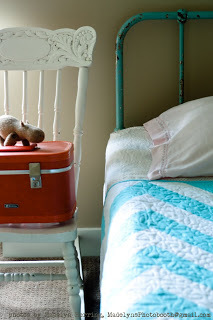 Have you ever made a chevron quilt? I'll choose a winner on Wednesday, October 17, at 6 p.m. PDT. Thanks for playing The Name Game this week, Cindy. I'll be working my way through your archives to pick up some ideas for doing some creating here in my home!